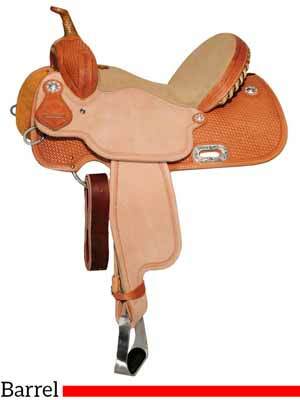 Compare prices for Circle Y barrel racing saddles from several major online sellers. 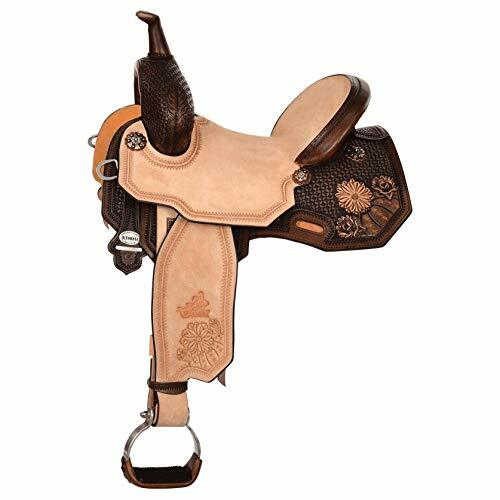 Circle Y Saddlery is renowned for making saddles and tack of the highest quality, including their line of barrel racing saddles. Made in Yoakum, TX since 1960, their products are sold only through authorized Circle Y dealers. 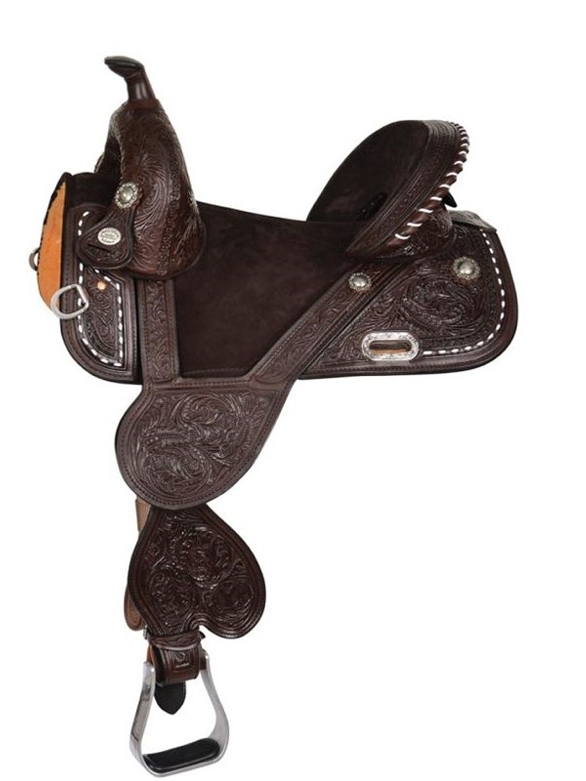 Below are Circle Y barrel saddles for sale. Julie Goodnight (English and Western rider and clinician with experience in reining, colt starting, dressage, jumping, cutting, and more; and star of her own television show “Horse Master With Julie Goodnight”). World champion barrel racer Martha Josey (multiple world champion, inductee into the Cowgirl Hall of Fame, and qualifier for the National Finals Rodeo in barrel racing for four consecutive decades). World champion barrel racer Kelly Kaminski (five-time National Finals Rodeo qualifier in barrel racing, two-time world champion barrel racer, and two-time reserve world champion barrel racer). World champion cowboy mounted shooter Kenda Lenseigne. 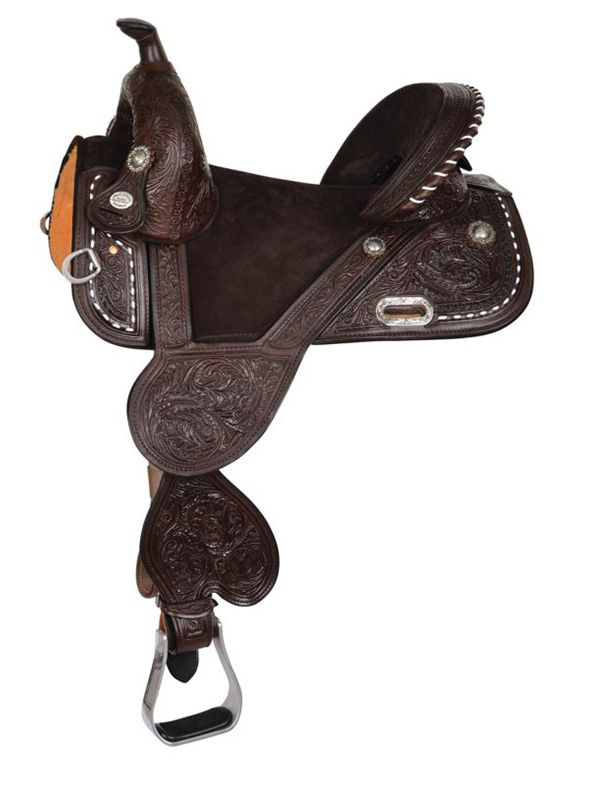 Below: A Circle Y Xtreme Performance barrel saddle from Horse Saddle Shop. This one is the Circle Y Barrel Racer 2166 with antique leather, 1/2 box stamp, blue suede seat padding, and blue cross conchos. Below are Circle Y barrel saddles offered for sale from major online sellers eBay, HorseSaddleShop, and State Line Tack. This centralized location makes it easy to compare selection and prices. The last time we checked HorseSaddleShop was the #1 Circle Y saddle dealer in the country, and has been for many years. 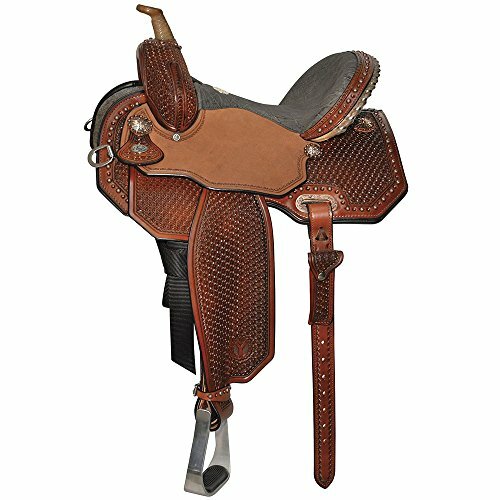 What Is A Circle Y “Xtreme Performance” Barrel Saddle? 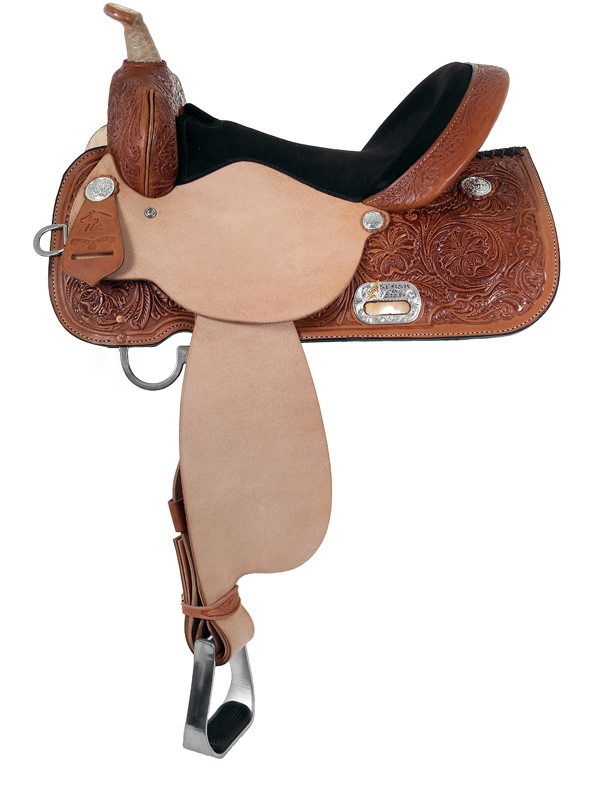 You may have noticed that some of the saddles above (but not all) are described as a Circle Y Xtreme Performance (XP) barrel saddle. So what is that? 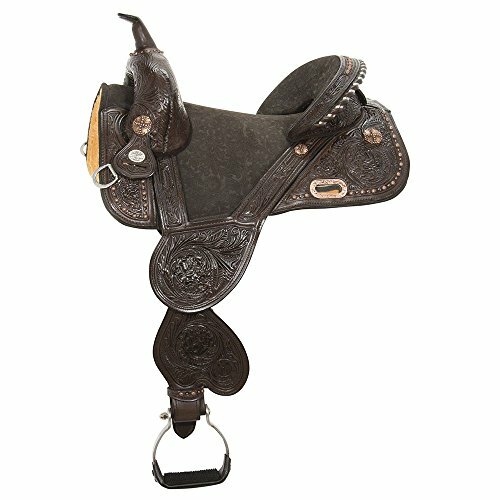 For complete information you can see this page on the HorseSaddleShop.com website: Circle Y Xtreme Performance Saddles. EBS Ergobalance Stirrups: For dereased ankle and knee fatigue while promoting balanced riding. XPG Bar Pad: The XPG gel bar pad does not break down and provides improved shock absorption and comfort in the horse as it compensates for variance in fit. leather lining providing improved fit and no slip. FAST Buckle Stirrup: The patented FAST buckle stirrup leather buckle is quick, easy, secure, and is constructed of 100% stainless steel. It makes stirrup leather adjustments quick and easy. MVS—Microvent Seat System: Perforated top grain Microvent leather seat breathes for superior rider comfort while remaining water repellant. (May not be applicable to suede and/or hard seats). A DURAhide covered tree that adds strength while keeping out moisture, adding to the life of the saddle. High density and low density saddle bars. High density bars offer support, stability, and even weight distribution. Low density bars conform to the horse’s back, which means they fit a wider range of horses while also giving the horse freedom of motion. Below: A barrel racer. 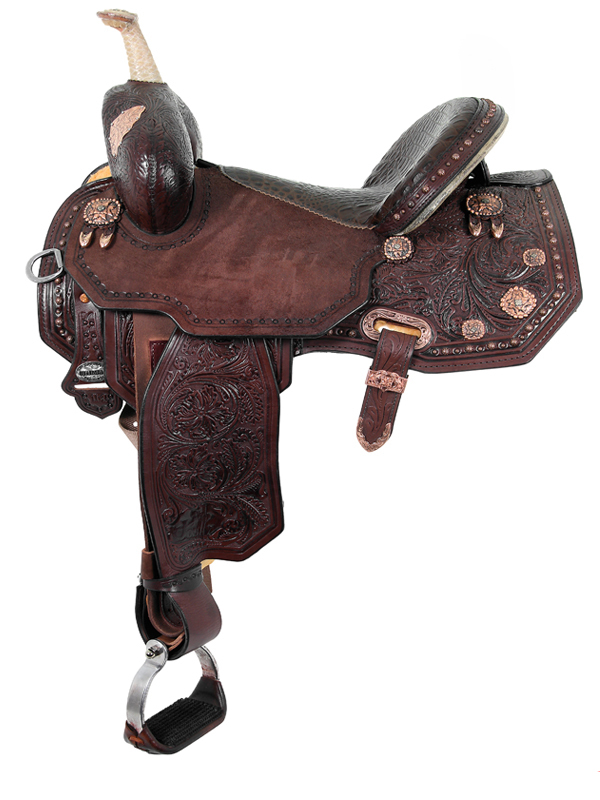 Barrel racing saddles are made to be lightweight, yet very secure to help riders to take hard, tight, turns at high speeds.